Scouts and Guides contributing to refugee support activities in their local communities in Europe (5): a stroy from Coxhoe, County Durham, United Kingdom. “Members of a Scout group from Coxhoe, a village in Durham County, are stunned that their simple act of kindness has garnered the kindness and generosity of the local community: all they did was organise a call for contributions in aid of refugees in Calais, France. And, the local community responded with a phenomenal display of solidarity, showing that there is still much humanity left in the world. The Coxhoe Scout Group initially expected to receive a small number of donated items, which they were planning to send to the sorting depot, but the response grew at a surprising rate. 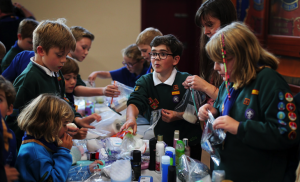 The call for donations of 60 determined Coxhoe Scouts was so successful that the village hall was completely filled with items like toiletry kits that the Cubs had packed themselves, shoes, clothes, tents, food and other essential things. The response was overwhelming, it was such a positive experience.